Philips Hue starter kits allow you to create connected and intelligent lighting systems which make it possible to control the color and intensity of lighting in your home remotely using your smartphone from wherever you are. The starter kits are made of one or more LED bulbs wirelessly controlled by a small device called "bridge" that is plugged to a wall electric outlet and connected via a supplied ethernet cable to your home's router. Once you download the associated free app to your smartphone, you are able program and control remotely the various bulbs in your system. The bridge plays the role of a hub and directs the signals it receives via Wi-Fi from your smartphone to the bulbs it controls. In effect, the bridge creates a mini network under the ZigBee protocol which is a low-power, safe, and reliable technology to control the lights. ZigBee allows also for software and firmware updates to be done wirelessly and directly to your lights. The smart and energy-efficient LED bulbs that come with these starter kits deliver bright and beautiful lights for your daily activities, special moments, and immersive experiences. They’re practical too. They can dim, they can flash and they can pulse. They can do pretty much anything you want. White & Color Ambiance Kit: It allows you to play with light and choose from 16 million colours using the Hue app to match the light to your mood. The bulbs have been improved with deeper green, cyan and blue for even better scene setting in your home. You can save your favourite light settings and recall them whenever you want with the tap of a finger. White Ambiance Kit: It allows you to play with white light and choose from 50,000 shades of white using the Hue app to match the light to your mood. In the morning, you can select the light brightness to increase gradually, mimicking the effect of sunrise and helping you wake up naturally, instead of being woken up by the loud sound of an alarm clock. In the evening, the relaxing warm white light helps you to unwind, relax and prepare your body for a good night’s sleep. White Kit: It allows you to play with a single soft white light, but features such as scheduling, found in the other two lighting kits, that can be used to make it seem like you're home when you're not, is also available here. You can set the lights to come on at a pre-set time, so the lights are on when you arrive home. You can even set different rooms to light up at different times. And of course, you can let the lights turn off gradually at night, so you never have to worry whether you've left any lights on. Note that you can always grow your Philips Hue family. Once you've set up your Philips Hue starter kit, you can go on and add up to 50 Philips Hue lights, luminaires, switches and other accessories. Just power them and add them to your system via the Philips Hue app. The Philips Hue app is available for both iOS and Android mobile devices (iOS 8 and up & Android 4.4 and up). 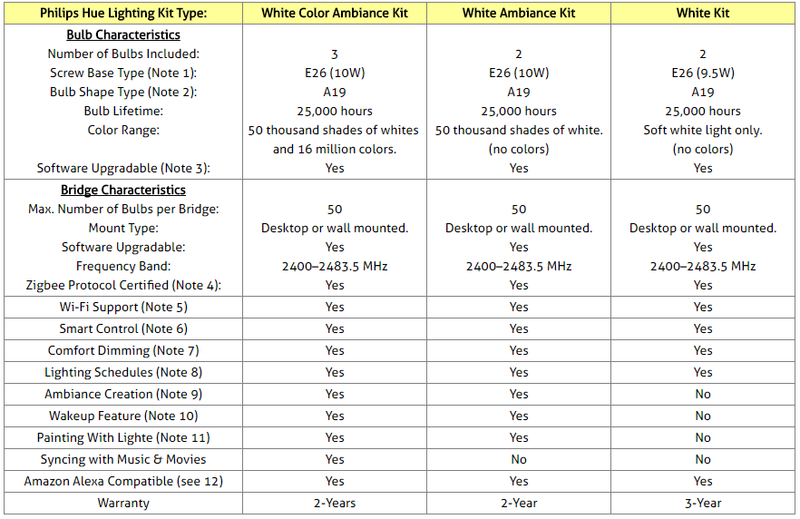 This article will compare the Philips Hue White & Color Ambiance, White Ambiance and White lighting systems starter kits. Philips Hue Lighing Systems Starter Kits on Amazon. E26 is the screw base size of most light bulbs used in the U.S. It's referred to as having a “medium” or “standard” base. The number following the "E" indicates the size in mm of the external thread screw. Thus, a E26 has a 26-mm base diameter. You may see low cost LED bulbs using an E27 base from foreign suppliers. While these technically will work in E26 bases, it is usually an indication that the bulb was not strictly designed for the US market and it may lack a proper North American, UL or ETL safety certification. "A" type describes a light bulb that has a pear-like shape. The number "​19" that follows the "A" indicates the width of the bulb in one-eighth inch units or in millimeters. A19 is the most commonly used A-series light bulb type which is 2 3⁄8 inches (60 mm) wide at its widest point and approximately 4 3⁄8 inches (110 mm) in length. ZigBee is an IEEE-802.15.14 based specification for a suite of high-level communication protocols used to create personal area networks for home automation with low-power low-bandwidth needs, designed for small scale projects which need wireless connection. The "bridge" that comes with all three starter kits is linked to Wi-Fi via your router to which it is connected with the supplied ethernet cable. It connects your system to the wider world via the Internet for out-of-home control and other smart features. All three starter kits allow dimming the lights using the Hue app from your smartphone. 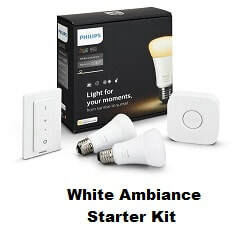 Note that White Ambiance Starter Kit also includes a dimmer switch that may come in handy if you don't have the smartphone with you. If needed, additional dimmer switches can be purchased on Amazon (see Amazon products section below). Using the Philips Hue app, you can easily set up the times you want the lights to turn on and off. You can set different times and colors for different lights. You can set light schedules for your daily activities, from the moment you wake up in the morning. This way, you will never forget to turn off a light when you’re leaving, or arrive in the dark when you’re coming home. ​Within each room, you can set and dim your lights individually for the optimal ambiance. In one glance, you can see which lights are set to what color and brightness. You can instantly change your room with the Philips Hue recommended color palette. You can use one of the preset scenes or let your creativity run free and create your own. Thanks to intelligent scene setting, the app can extract the color palette from any picture and create a vibrant mood. It can also react to the type of lights you have in your room, so you always get the best light experience. ​You can set the bedroom light so that the gradually increasing brightness gives you the feeling you are waking up gently from natural sunlight. By choosing different colors for different lights and orienting them towards your home's walls according to what colors you want your walls to be, you can paint your walls without any paint and change the colors at will whenever you are tired of them. All three starter kits are compatible with Amazon Echo, Tap, and Echo Dot. So which of the three Philips Hue Lighting Systems Kits to buy? Clearly, if you are interested in painting your walls in various colors using lights and changing these depending on the ambiance you want to create and your mood, you should be considering the White and Color Ambiance starter kit. If you are just interested in creating your home's ambiance with different shades of white, then go for the White Ambiance starter kit. 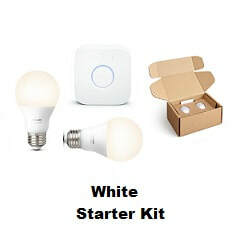 If ambiance creation, is not your priority, but you are just interested in having some soft white light all around your home, and still be able to control and program remotely the lights, then go for the White starter kit. All three kits can be obtained in the Amazon section below. 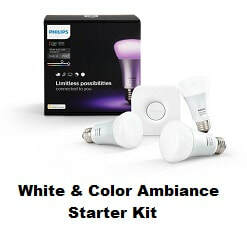 Please click the Philips Hue Lighting System Starter Kit of your choice below for price information or to purchase.